Sefton and Costain are both deep undercover in an investigation to bring down one of London’s nastiest and most feared criminals, Toshank. Even though they’ve gotten as close to him as they possibly could and have been embraced into his inner circle they still can’t figure out who physically carries out the most gruesome dirty work. Midnight draws near and they both know time is running out for them to make a break in the operation as Toshank is about to skip the country and therefore evade conviction. Toshank had spent the evening dragging his men to houses across London, seemingly in search of something but none of them knew what. At the last minute, the operation goes in and takes Toshank down. The police think they might be able to nail him at last but just as they start to begin the interrogation process Toshank starts to act strange, as if he’s suffering from some kind of seizure, then explodes in a mass of blood. The police are all shocked and confused, with no idea what could cause that kind of death, so a newly created team return to some of Toshank’s old haunts to see if they can put the pieces of the puzzle together. At one of those houses, their lives change forever. They are given the ‘sight’ and once faced with the evil behind Toshanks crimes, they realise that London will never be the same again. Full of recognisable London locations, football teams, language and style, the city lives in the storyline as a character in itself. 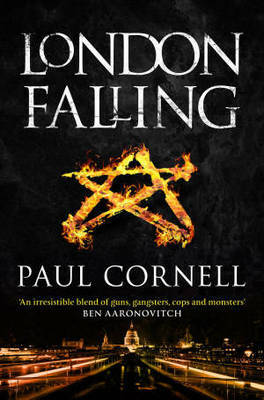 Paul Cornell has previously written for television, shows such as Dr Who and Coronation Street and this comes across in his style that could easily be imagined on screen. The one problem I did have with this novel was the lack of physical descriptions and amount of names contained within the first few pages. The author also occasionally flips from surname to the first name, which added to me struggling to get into the story itself. After I figured out who was who and got to grips with the plot, I thoroughly enjoyed it and found myself picking it up as often as possible. Each of the four main characters backgrounds and fears affects the actions and reactions to the evil they are threatened with and there is a fabulous twist with one of the characters that I just didn’t see coming. If you’re looking for a grittier Dr Who or enjoy Ben Aaronovitch then this will be right up your street. This is the first in a series and I can say I will definitely be reading the follow-up.